It has Powerful processing and beautiful design unite on Surface but is it worth for that price. i bought this yesterday nice table faster than all other tablet. AnonD-10315, 11 Dec 2012Wish I wud have supported apple here then I wud have been an Apple employee (as they pay much ... moreBrilliance for free; your paenrts must be a sweetheart and a certified genius. AnonD-10315, 06 Dec 2012Wish I wud have supported apple here then I wud have been an Apple employee (as they pay much ... moreAwful phone, Too big, cheap thin platic and what an aboltuse mess of an operating system.I SEE LAG, LAG AND MORE LAG WITH ANDROID. It is very annoying in Windows 8 that you cannot change Photo app's background color when viewing pictures and it is not possible to zoom in because your picture is becoming pixelated. Anonymous, 23 Nov 2012Having 2 OS, one mobile, other desktop, fine (with the aim to ultimately merge them). But havi... moreAt last! Sometihng clear I can understand. Thanks! Horrible OS! But love the windows phone os. No GSM..? How can I use this device while on the road..? MS habit bring into the market incomplete product and revise later then ask consumer buy a new one, just like WP7 did. i just got a w8 laptop and is the best if you turn off the auto update and turn off some program that not need to start up in start up.. hi!! someone know can use sopcast app on this tablet? AnonD-10315, 26 Nov 2012Ok, nothing personal...its just I saw all of your points irrelevant or you trying to justify e... moreFirst off, you sound like a microsoft employee. Lol I dont hear anyone besides them say "bing" instead of "search" or of course "google". 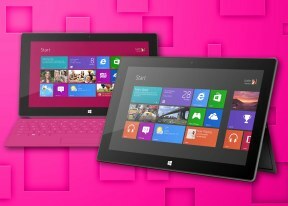 Also, i have tried the surface and it is a great tablet but I personally expected a better interface. It seems too easy and boring, after 10 minutes of it i'm ready to put it down and not use it again, which is never good for a multi-hundred dollar purchase. But i guess thats me, i currently have a nexus 7 and love it lots but the keyboard case is great and would have been a great add-on to any tablet. AnonD-10315, 26 Nov 2012Ok, nothing personal...its just I saw all of your points irrelevant or you trying to justify e... moreWell, actually I was disappointed by the device, but then I recently know that they will release Microsoft surface Pro in the first month of next year. 1- As I said before the low number of application is the reason why it will be inferior to others if it can't manage programs. 2- Yes I have tried the same kind of these keyboards before and I know the difference. + I think If they add in the future a pen like Galaxy Tab2 will probably be more suitable than my idea of a small mouse. 3- I believe that they know that Ipad3 has a very good resolution screen, so they must make a similar screen resolution . Look at Samsung with Google Nexus 10, I believe that most of the new tablets will have amazing screens. The resolution of surface is good,but It is not for Microsoft flagship tablet, which by the way the surface pro will got full HD(1,920x1,080),still less than Ipad 3, Ipad 4, kindle fire and Nexus 10,but at least full HD and as you said better than most of todays tablets. 4- Thank you for respecting my opinion. I hope you enjoy your surface. mindedd, 25 Nov 2012Hei, anyone knows if Windows RT/MS Surface has remote desktop application to access other wind... moreYes, it does have..